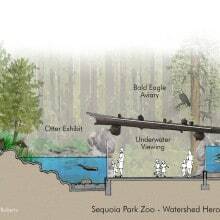 The Sequoia Park Zoo Foundation was awarded a $2.3M grant to proceed with the next stage of the Master Plan – the foundations of the Native Predators exhibit in the form of the Watershed Heroes project. This project brought River otters back to the zoo, as well as Bald eagles, three local salmon species, our Northern spotted owl and North American porcupine, and a new learning lab. Groundbreaking on the project occurred in July 2013, and the River otter and salmon habitats opened in August 2014, with the McLean Foundation Raptor Aviary, home to our Bald eagle, Northern spotted owl, and North American porcupine, following in April of 2015. 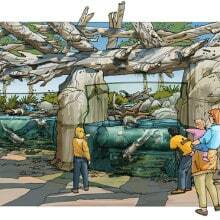 With the completion of Watershed Heroes, visitors enter a whole new world when they arrive at the zoo. 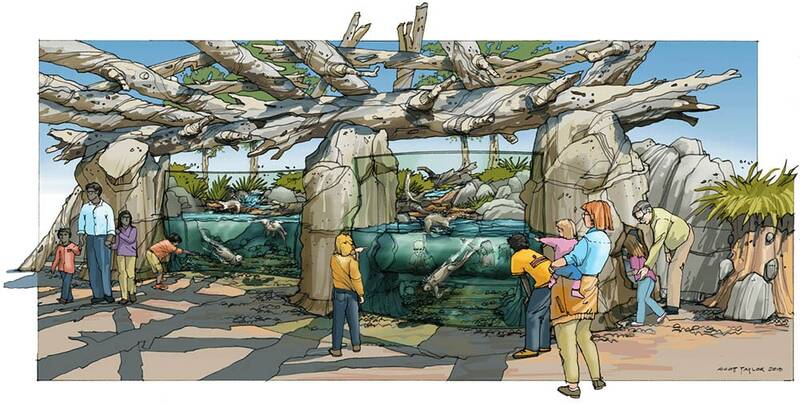 We engaged specialized zoo designers to ensure every visitor’s experience is truly awe-inspiring and the habitat provides an appropriate and engaging space for the animals year-round. The family-friendly exhibit starts with an open entry space and watershed play area. Here, children can explore a real watershed and investigate the salmon images in the walkway beneath their feet. 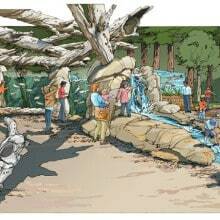 Next, visitors will encounter a dramatic waterfall that recreates the natural cascades salmon must navigate to travel upstream and spawn. 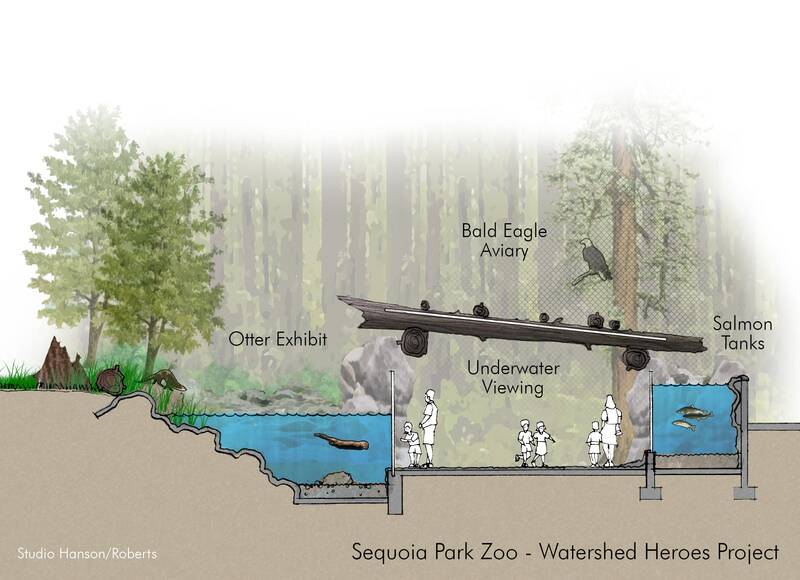 Overhead is a tumble of logs that creates a shelter over the “streambed” walkway, while clear walls on either side give visitors an intimate view into the underwater life of salmon and otters. These above-ground tanks enable visitors to see otters playing on one side, and on the other view salmon feeding, guarding a redd (nest), and perhaps even a salmon carcass from the other side of the tank – all demonstrating the important role salmon play in human, animal, and forest life on the North Coast. The entire exhibit is a living example of a healthy watershed, where visitors can learn how everything is interconnected – and how they can help protect this fragile environment. If you haven’t visited the zoo recently, take a look at the photographic progress in the Watershed Heroes album on our Facebook page. 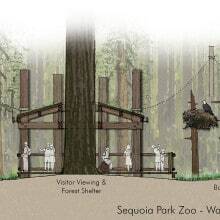 At the far end of the exhibit, visitors encounter the first Bald eagle to call Sequoia Park Zoo home, Cheyenne, as well as long-time residents Winky the Northern spotted owl and Dorsie the North American porcupine. 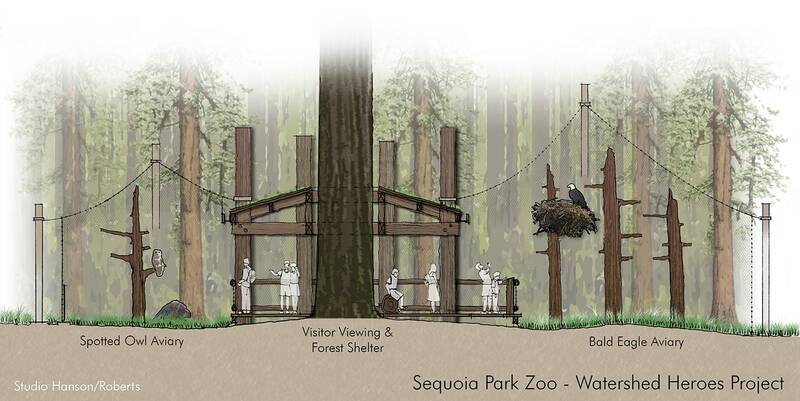 The McLean Foundation Raptor Aviary provides a permanent home for injured birds that can no longer fly, within a natural setting on the edge of the redwood forest. A magnificent redwood tree inside the aviary serves as a focal point where visitors can step inside their habitat for close-up views of these magnificent birds and to get a sense of what their life in the forest is like – particularly exciting for those of us who’ve been tracking the Humboldt Bay eagle family from the live webcam! Natural features such as logs, snags, and boulders provide a variety of perching and roosting areas for the raptors, and a pool gives Cheyenne, a water-loving bird, the opportunity to bathe and forage in the water – enabling her to engage in a full range of natural behaviors. Specialized soft mesh netting encloses the top of the aviary to keep the birds safe, yet still allow them a 360 degree view of their surroundings. Children will be able to experience the world of eagles by building their own aerie with a life-sized eagle play nest just outside the aviary. The project also includes a new Learning Lab to provide an insider’s view of the salmon pool and eagle habitat, as well as the opportunity to study water chemistry and other aspects of watershed science, and to observe the animals in their natural environment. This area is also used to tell stories about the intricate relationship between salmon and humans, past and present. The Watershed Heroes neighborhood replaces some of the oldest buildings in the zoo which recently housed Winky and Dorsie, as well as our ravens, Cotton-top tamarins, rainbow boa, and tarantula. The ravens will move into the next phase of the Native Predator zone development once funding has been raised to design and build their new home. The Cotton-top tamarins have been moved into the Nancy Hilfiker aviary with free-choice indoor and outdoor access. The tarantula has found a new home…and purpose..in our Education Department as an ambassador animal, and the rainbow boa has found a new permanent home with one of our former zoo keepers. 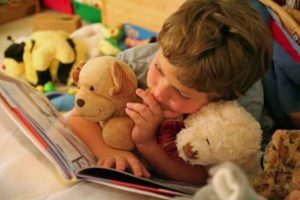 Help ensure the success of more projects like this by making a contribution today!